Hyundai has finally revealed pricing and options details for the second-generation Veloster. Following its debut at this year’s Detroit Auto Show, Hyundai has finally revealed pricing and available options for the , which is slated to arrive in dealerships Q2 2018. With a fresh design, premium interior, and new powertrains, Hyundai’s popular hatchback has been thoroughly modernized inside and out. 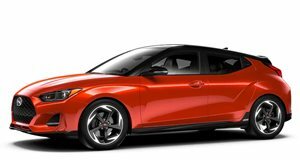 The naturally aspirated base model starts at $18,500 while the Veloster Turbo will set you back $22,900 with a six-speed manual and $25,400 with a dual-clutch transmission. Topping the range is the Turbo Ultimate, which starts at $26,650 with a manual and $28,150 with a DCT. Powering the base model is a 2.0-liter four-cylinder that produces 147 horsepower and 132 pound-feet paired with either a six-speed manual or a six-speed automatic with three driving modes: Normal, Sport, and Smart. Upgrading to the Veloster Turbo will give you a punchier 1.6-liter four-cylinder with 201 hp and 195 lb-ft of torque. An over-boost function raises the peak torque output to 202 lb-ft. All versions of the 2019 Veloster now come with torque vectoring, allowing for faster cornering when accelerating by applying precise braking force to the inside front wheel. Forward Collision-Avoidance Assist and Lane Keep Assist are included as standard, while Brake Assist, Blind-Spot Collision Warning, and Rear Cross-Traffic Collision Warning are optional. Inside, the Veloster includes a seven-inch infotainment display as standard, but buyers can upgrade to an eight-inch screen. There’s also an optional head-up display that projects onto an eight-inch transparent panel behind the instrument panel. The base 2.0-liter and Turbo R-Spec trim is fitted with cloth, while the 2.0 Premium and Turbo models feature a mix of cloth and leather. The range-topping Turbo Ultimate has an all-leather interior with a two-tone pattern. As for the more powerful Veloster N, Hyundai won’t be launching the hot hatch until later this year. It uses a 2.0-liter turbocharged four-cylinder with 275 hp and 260 lb-ft and is exclusively available with a six-speed manual. No word on pricing yet, but expect it to be more expensive than the $28,150 Turbo Ultimate with the dual-clutch gearbox.